So although I was supposed to start taking my Lupron on Monday (whoops), a couple days isn’t the end of the world (even though it DOES mean two more days of the evil BCPs! ), so I was given marching orders to start taking it today. 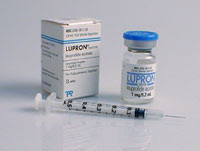 Of course, my protocol has me taking Lupron in the morning, and I didn’t find out about this until, oh, 2 o’clock-ish. No problem, because as much as the clinics all like you to *think* that the timing on these meds is super-duper important, the fact of the matter is, there’s plenty of room to fudge it. So really, it’s all good. Just for good measure, I emailed my nurse to make sure and she said it was fine to take it when I got home today, then take tomorrow’s dose around noon, and then Friday’s dose on my morning schedule. Fine. No problemo. So anyway, I get home to take the Lupron. Bear in mind, I’ve never taken Lupron before. And we didn’t take an injection class, because, seriously? Why would we? So I’m looking over the stuff, and it’s a multi-dose vial, with insulin syringes, etc. Easy. Except then I start realizing I’m not sure I understand the unit of dosage. My instructions say 20 units. But what KIND of unit? I call my husband and ask if he’s close to home. Fortunately, he’s just pulled into the driveway. It is handy having a pharmacist for a husband. So he came down and explained to me like I’m a five year old that “unit” was exactly the word they’d intended to use because some medicines are measured in “units of activity” or some such thing. Whereas I’d thought they were using some nebulous, non-exact unit of measurement, it turned out, they were using the technical term, and if I’d looked at the syringe, I would have seen that the syringe also had things labeled as “units” so my minor panic attack was unwarranted. Anywhozit, aside from having to shoo my eldest away a few times, it went smoothly and in plenty of time to let my nanny go for the night. Tomorrow will be trickier because I’ll have to take it at work since I’m supposed to take it at noontime, which presents two separate problems: first, now that it’s been opened, the Lupron has to be refrigerated. We do have a refrigerator at work, but … sheesh. Secondly, doing this in a cramped bathroom stall? Not my idea of fun. Nevertheless, it’s not like I haven’t done it before! Not pictured is my Follistim Pen, which I forgot to include. Wow, this is bringing back memories. I always figured I could do the shots again no problem but you’re right- it’s been a while and I have no idea if I’d remember how to measure and inject. Thinking of you lots. Gee, those shots are SO much fun. Why would you both need to take Doxycycline in the last year? That is just strange. No one ever cared if my husband took an antibiotic during our infertility journey. ack – the progesterone makes me cringe!! is that the same as the p-17 IM shots i had to take during my pregnancy? those things hurt like you know what and itched just as bad! not envying you here…but knowing it’s all so worth it!